‘Border Controls’is an exhibition considered within the shadow of increasingly restricted borders and political controls with regard to migration and the increasing isolationism seen both here in the UK (with Brexit) as well as the wider geographical tensions seen currently in Europe and America. The collaboration between Davis and Hibbs sees the artists consciously inhabiting the thresholds and boundaries between their respective practices in an attempt to open up conversation and discourse around these issues. The personal and political dimensions of art-making and authorship are seen here as a lens through which to consider wider social concerns and questions that address the dynamics of power, autonomy and control.’ ..from Exhibition text. The show’s signature piece, ‘Border Controls’ is a collaboration between Rosalind Davis and Justin Hibbs which takes a few seconds for the eye to register in a white gallery where a white reflection against a white background is difficult to place. The impression of looking ‘through’ to something ‘over there’ feels at odds with a sense that it is not ‘over there’. 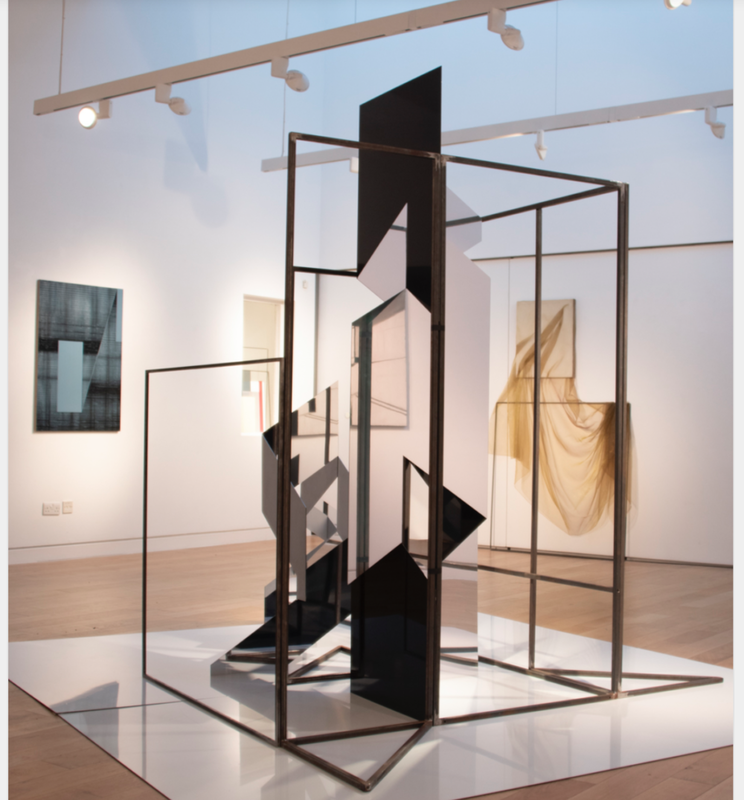 An open-ended box-metal structure both supports the mirrored Dibond and directs our attention to this or that and this and that through the ‘framing’ that occurs as we look at and into the piece. We operate with the structure as a ‘Composing Machine’, juxtaposing surface, line, and space, pictorially flattening, expanding, simplifying and complicating the reflections as we go. As an infectious notion of composing takes shape, we are both empowered and constrained by the frame to choose and compose, reject and move on. Looking from the ‘other’ open end of the piece, the ‘back’, alter-ego to the mirrored surface, is softer in black and grey, pulling, as it were, its mirrored side out to escape to a freer space; ground, welded corners and workplace matter-of-factness of steel subvert any illusions that the reflections might harbour of what might be real. The placing of Rosalind Davis’ piece ‘How Far Have We Come?’ behind a window in the gallery office, outside looking in, seems to challenge its status as art. Composed of what might be offcuts of translucent sheets of perspex, a ceramic tile, mirror, canvas and thread, with rectangles fabricated from steel rod somewhat similar to the Quadrat used in botanical sampling, it stands a little uncertain, nose to the window, having waited patiently against a studio wall, its offcuts and physical bits and pieces of ideas occupying liminal spaces of mind and place, memories not quite discarded, in search of purpose. In this way it approaches the gallery cautiously, revealing itself in the manner of taste when we come across something and discover that our pleasure in it is a measure of how far we have come. A square canvas fixed to the wall with below it a steel frame leaning against the wall, support a draped piece of brownish-yellow polyester organza. This is ‘Freefold’, and like the adjacent ‘How Far Have We Come?’ has a feeling of something in transition. Draped like the dead Christ, it is also complete in its transitional state, in limbo, a deposition, an idea under consideration. Organza is domestic, theatrical, tactile, material to be inhabited, curtain and clothing, veiling and revealing, worrying, a guardian of secrets. Justin Hibbs’ work is harder on the knuckles. Its surfaces and edges carry a message of disintegration. ‘Interval Interference111’ is evocative of redundant industrial sites, gates, barriers, concrete floors, car parks, perimeter fencing. The sense of unease to be found in such places is compounded by an alternating current of flatness and space created by black and white strips against raw canvas, the paint surface distressed by a cursory masking technique. Similarly in his work ‘Void’, its compelling, curiously oscillating structure endures despite a seeming fragility of being, its lines apparently breaking up, its space neither here nor there, and both here and there. Two flat rectangles become empty spaces clinging to either end of a line that is a space that is a line that connects them and which bounds an unsettlingly ambiguous spatial twist. The differences to be found between the works of Davis and Hibbs are complementary in a manner that might once have been described as stylistic difference, style as signature, the mark of the artist and a scaffold for the construction of the work. But the manner of making is more than simply technical. Sensibilities and sensitivities inhabit touch and mark, eye and concept, point and counterpoint. Inferences resonate knowingly through the works here in a to-ing and fro-ing of aesthetic positions. Subjectivity presses like the piece at the window. The implicit notion of taste that infuses this show offers hints and tints of suggestion, of control and direction, the collaboration dance-like, leading and following, point and counterpoint, taste as political, taste as coercion, taste other than the trivial positions to which everyone has a right.